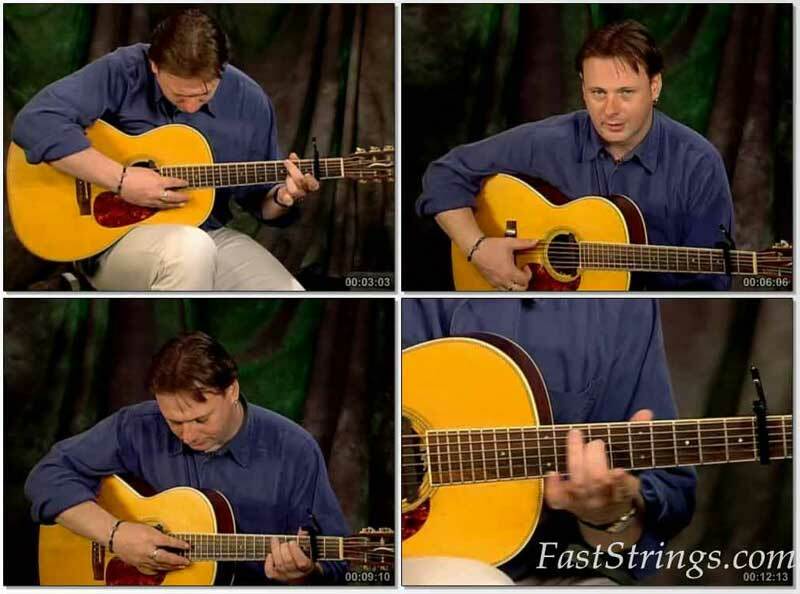 Celtic Fingerstyle Guitar According to Tony McManus. Tony McManus is an adept master of Celtic fingerstyle guitar, both in terms of adapting Celtic music to the guitar and in its performance – presenting all it intricacies, graces, and frills yet at the same time maintaining the pace and drive which characterises this style of music. Volume 1. In this first lesson, Tony discusses in detail the importance of ornamentations and triplets in Celtic music, and importantly, how this can be technically achieved. Scales and fingerings and playing in the DADGAD tuning are discussed and then illustrated with several melodies played in this dropped D tuning. This is a challenging DVD lesson for intermediate fingerstyle guitar students, but one that will be very rewarding as you learn to play Celtic Music from one of the finest players of this genre. Volume 2. In this second lesson for Celtic Fingerstyle Guitar, Tony McManus explores all the dance rhythms of Scottish music, with its pipe-marches, strathspeys, single and double jigs, slip jiogs and reels. McManus has been notably succesfull in translating the complex music of the highland bagpipes to the guitar and, to maintain the integrity of the music, he introduces three unusual tunings: CGCGCD, CGDGCD and DAAEAE. The idea and playing of sets is presented, as well as further exploration of ornamentation techniques. anyone know where is the 2nd vol pfd? in witch link? Does anyone have the Booklet 2? it is great! hope much stuff! Can I just download the PDF? Oh my god you’ve made my year, I have been looking for this and the John Doyle DVD’s for a long time… thank you so much!!!! thanks even a whole lot extra!